I look forward to dinner with my family every night. It’s one nonnegotiable in our schedule. But believe it or not, it’s not necessarily the most peaceful part of my day nor is it even my most peaceful meal. Dinner, for my family, is often crazy and chaotic and I’m not alone. Many of the individuals I work describe their dinner time meals in the exact same way. And let’s face it, dinner is often challenging! Not only are we short on time, but we often have multiple people weighing in on what to eat or being easily distracted by the world around them. Not to mention the constant demands our kids often make while we attempt to get plenty of food around the table. So it’s no wonder that for many families, this meal loses it’s luster. But guess what? Meals together matter. Although the meal you eat as a family or enjoy with friends doesn’t necessarily have to be dinner, this may be your opportunity to spend time together and reap the many benefits family meals can provide. Maximize your prep time. For some, this may mean prepping entire meals in advance. If this works for you, awesome! 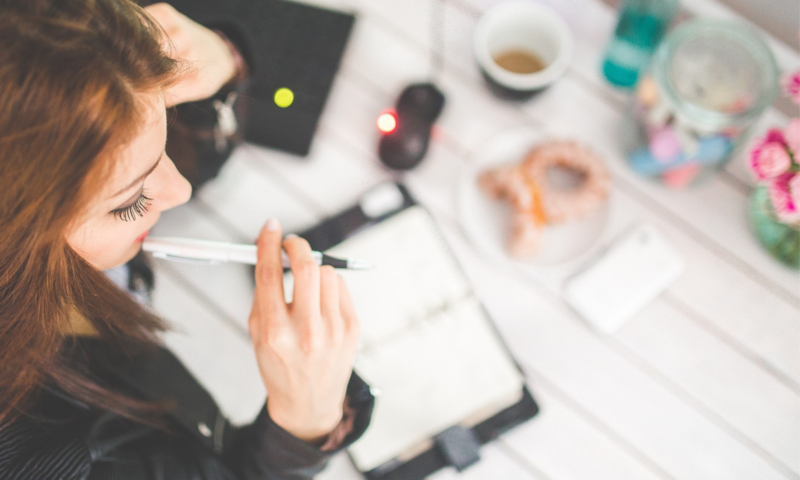 If you find that you are always busy or this seems too big of a project to attempt right now, look for ways to maximize your prep time in shorter intervals. 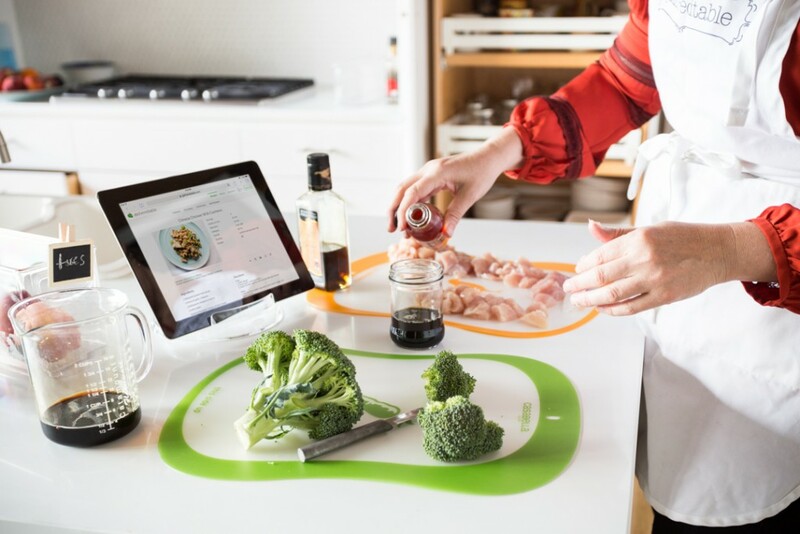 For example, you may not have time to prep an entire meal in advance, but maybe you have 5 extra minutes you can add in one evening while prepping a different dish. In that extra five minutes, consider preparing extra servings of vegetables, or reserving some parts of the meal you are preparing (think chicken breast, rice, quinoa, beans, etc). These items can then be stored in the fridge and incorporated into other meals throughout the week. Create a plan for success. Knowing in advance what meals you want to enjoy can also help relieve stress and save some time. 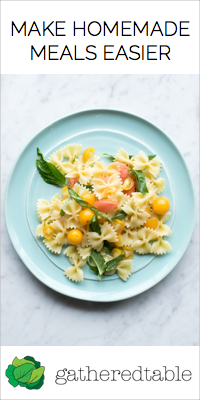 If you arrive at dinner time unsure of what is on your menu, it may take longer to figure out what you’ll eat and possibly frustrate you along the way. Even a general idea of what you’ll eat in advance can help you feel more prepared at meal time. Not sure where to start with your meal plan? 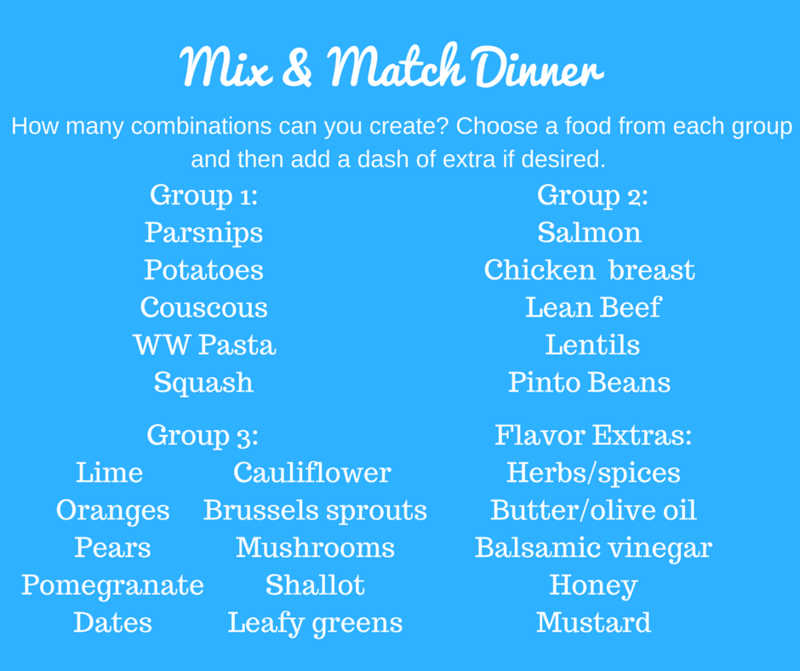 Use this easy graphic to mix & match a few foods together to create balanced meals for the week. Establish a consistent meal time. I’m not sure if anyone likes their meal to be a surprise, especially when they are hungry. Establishing a consistent dinner time allows everyone to be prepared for when to eat. This can also help individuals better regulate hunger or plan snacks accordingly. Being overly hungry when dinner is ready, well, even I might throw some tantrums in that state of mind. Have a snack handy. This strategy may not benefit everyone, but depending on when you’re able to get dinner on the table, may be an important step towards everyone eating well together. A small snack offered before dinner prep begins may help calm ravenous appetites and keep kids occupied while you start preparing your meal in the kitchen. Offer options. Although you should avoid becoming a short-order cook for your family, it is okay to offer variations of a meal. Whether this is a deconstructed option where kids and adults alike can select which ingredients of the meal they want to incorporate on their plate, or even providing a base meal and then one or two optional add-ins, this method can give everyone the opportunity to create a meal they love without having to create multiple, separate dishes. Keep one kid-approved food on the table. Sometimes new foods are intimidating for young eaters. To help reduce food anxiety, make sure there is a familiar food for your child on the table as well. In my house, this is usually cottage cheese, bananas, or bread – all foods my kids enjoy and will eat no matter what else is on the table. By ensuring they have at least one familiar food, you can also stress less knowing that they will at least eat something that you’ve offered. Acknowledge the chaos. To really make meals manageable, it’s important to be realistic with what to expect. Unrealistic expectations may set you up for a failed experience before the meal even begins. Recognize that it probably will be chaotic – something will probably get spilled, someone will probably not like something you’ve served, and someone will probably be done eating far sooner than anyone else. By acknowledging the realities of your family meal time, you can come to the table prepared. This may mean you have a plan of action for how to deal with these certain situations or it may mean you look for ways to focus in on what truly matters. Either way, awareness can allow you to be best prepared for whatever may happen. Stay positive. You have the ability to set the tone at meal time. Actually, we all do. By intentionally deciding to approach our dinners with a positive mindset, we automatically affect the overall tone of the meal. It may take a few meals for your positive attitude to impact those around you, but it can be a good start towards more enjoyable mealtime moments. Know your division of responsibility. Division of responsibility is a way of deciding what role parents and kids play at meal time. According to the Ellyn Satter Institute, parents are responsible for the what, when and where of eating. Children, on the other hand, are in charge of how much and whether to eat from what parents provide. This division can be difficult to master, but as you become more comfortable practicing it, it will help make meals more enjoyable overall. Remember why you’re gathering together in the first place. In the hustle and bustle of meal time, it can be easy to forget why you’re gathering together in the first place. After all, wouldn’t it just be easier to eat on your own? No matter who you decide to eat with, family-type meals are associated with all sorts of benefits. In fact, families that eat together 3 or more times a week may see improvement in their emotional well-being and enjoy more nutrient-rich foods that sustain an active, satisfying life. Kids who eat with their parents may also perform better academically, be less likely to engage in risky behaviors, and have a better relationship with their parents. Making time for dinner can be very beneficial for you and the ones you love. Consider incorporating a few of these strategies to make meal times work for you. Need more reasons to make meals work? Here are some great insights from the Six O’ Clock Scramble. Let’s stop planning meals and start building them instead. To do so, you need foods that work well in a variety of ways. Do you know what foods you need to build successful meals? If not, you may benefit from creating your own basic food list. The essentials. What are your go-to meals? We all have them – those meals that consistently greet us no matter how busy our schedule gets. Whether its spaghetti and meatballs (which just happens to be one of mine) or Filet mignon (not one of mine! ), we all have meals we turn to time and time again. This means we have go-to foods as well, but we often fail to think about our meals in that way. These go-to foods are the essential elements necessary to create meals you enjoy. By breaking down our meals into their food components, we can create a list of foods we need to stock our kitchen with. We may even be able to identify ways to modify or enhance our regularly occurring meals by incorporating new foods to the mix. When we break it down, our food list is where potential lies, where real meal magic happens. Because without our go-to foods, we don’t really have meals to speak of. The Basics. As you are creating your food list, I’m hoping that some of the basics will pop up on your list more than once. Okay, what I’m really hoping for is that they pop up A LOT. Not quite sure what the basics are? The “basics” are foods that fit within the five basic food groups – fruits, vegetables, dairy, grains, and lean proteins. These are the true essentials – the foods providing your body with lots of nutrients, flavor, and variety. They should be showing up pretty frequently in your meal plan – like 80% of the time. They don’t necessarily have to be the only foods you eat, BUT they should provide the structure of your plan. My Essential Foods. Instead of having several go-to meals in my regular rotation, I like to have between three to five different foods from each food group to start from. This ensures I always have the ingredients I need to keep meals nourishing and simple. Of course, this list doesn’t always stay the same, but it is a nice starting point to ensure more of my meals are eaten at home. How to Build Your Own Food List. Ready to build your own food list? 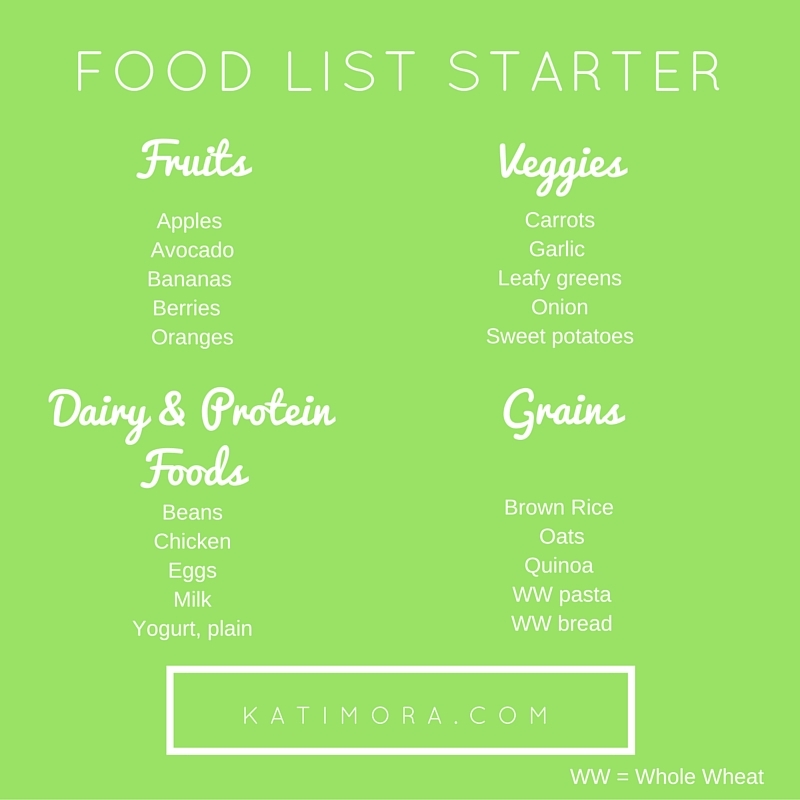 You can use my starter list as a launching point, but in order for your meals to be successful, use the following guidelines to help create a food list that works specifically for you. Keep Seasonality in Mind. One of the reasons my food list doesn’t always stay the same is because I try to eat with the seasons. This can be a great way to add variety to your plate, save money, and experiment with new foods. Building your food list with seasonality in mind can also increase the likelihood that you’ll find the foods you need in the grocery store or at your local farmer’s market. Be True to your Palate. Not every food that’s good for you will be an automatic hit for you or your family. And guess what? That’s okay. Be sure to build your food list with your preferences in mind. But please make sure you are always leaving a little bit of room to give new foods or foods you haven’t eaten in a while a chance. You’d be surprised how many foods you disliked as child are actually appealing to your taste buds as an adult. Or how much a different cooking method, preparation technique, or the addition of a certain spice or seasoning can change the way you approach a food. Always keep an open mind – pretty pretty please! Remember why you’re eating in the first place. This may seem silly, but sometimes when we’re so focused on creating a list of foods we “should” eat, we forget that we should also be enjoying our foods in the first place. It’s important to work in foods that you love in addition to the foods you know are good for you. I like to think of this as balance. Balancing out your plate so that you have a good mix of foods that make your meal worth eating. This is also why starting your list with a few of your current meals in mind can be a great place to start. Consult your physician or registered dietitian. 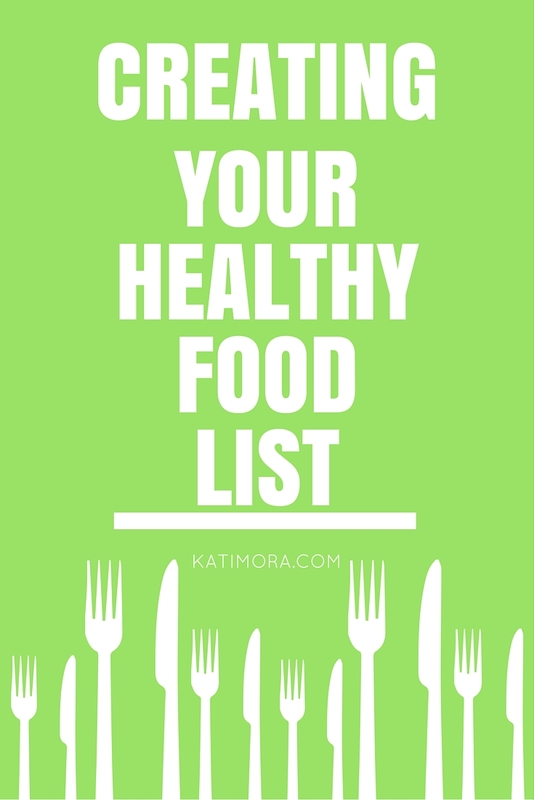 Building a food list may also require consulting with your physician or registered dietitian, especially if you have special dietary needs or a medical condition that might require you to eat a certain way. Meeting up with a registered dietitian, like myself, may also help you identify new ways to enjoy nutrient-rich foods or approach food in a positive way. Want more inspiration? I love this ultimate grocery-list-for-one registered dietitian Dana Angelo White put together over on Greatist. Be sure to check out! And if you haven’t already, be sure to sign up for my weekly newsletter – you’ll get my pantry starter kit download for FREE when you do! Everyone has to eat, but knowing what to eat isn’t always easy. That’s why I love Gatheredtable. It makes eating well easy to do no matter your schedule. Healthy, homemade meals are my favorite. As a dietitian and mom, I love the challenge of discovering new recipes that not only provide my family with the nutrients and energy they need for successful days, but ones they actually want to eat again and again. It sounds easy – like I have it all figured out – but believe me, I don’t. Even as a dietitian, my kids are kids, making decisions based on their limited life experiences and preferences. Like every other kid, my boys tend to like simple and sweet offerings more than complex or bold ideas. My foster kids – well, they really like the sweet stuff. In fact, when I asked what their favorite foods were on the day they arrived, the oldest told me very decidedly that her top three foods of choice were “honey, sugar, and candy.” No, she’s not Buddy the Elf, but she does come from a different home with different rules and different foods. Sometimes, I need fresh inspiration. Foods I like aren’t always what those around my table like and with even more diverse taste preferences surrounding me these days, its incredibly helpful to have a variety of simple meal ideas at the ready. That’s where Gatheredtable comes in. Recipes are real-life ready. This is a big deal. Real-life ready recipes? Are you kidding me? Anyone else have a hard time finding recipes online that they would actually make? I can’t tell you how many times I’ve found beautiful food photos only to be accompanied by unrealistic and super long ingredient lists. I love that Gatheredtable keeps their recipes simple and to the point. This means I will actually make the food I see, and for a meal planning service, that’s a pretty important feature. Ingredients are easy to recognize BUT may push your food boundaries just a bit. Recipes on Gatheredtable aren’t just easy to follow; they also rely on familiar ingredients. This means I can rest easy knowing that I can find the necessary foods each recipe requires in my grocery store. In some areas, you might be able to even order your foods directly from Gatheredtable thanks to their grocery list feature. The work is done for you… sort of. Half the battle of getting dinner out on the table is planning (or lack thereof). Gatheredtable allows you to easily identify recipes for the week, add them to your meal plan, and create a grocery list. The only thing you have to do is buy the ingredients and make them. 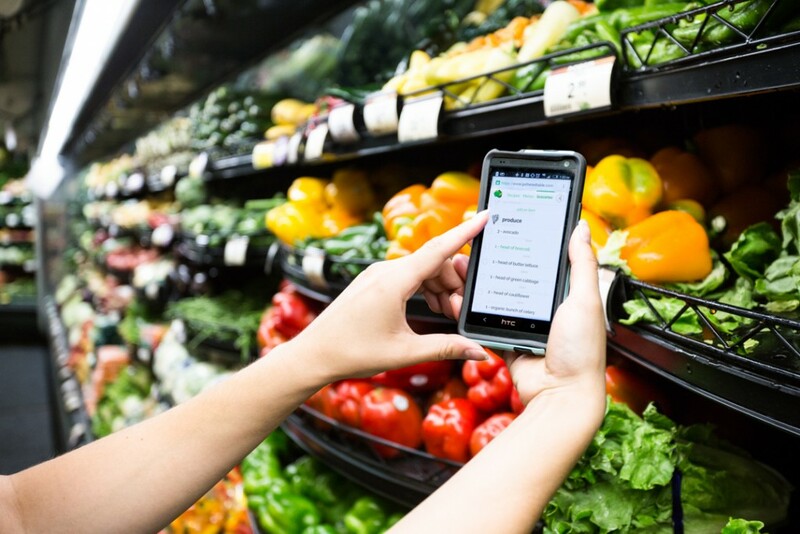 With their handy mobile app, you’ll even be able to take everything with you to the store and into the kitchen. This means you always step into your kitchen with a plan and will hopefully have more time to spend enjoying the meal versus fretting about what you’re going to make in the first place. Meals will become more enjoyable. With much of the pre-dinner work done, you’ll hopefully be able to relax and enjoy the meal a bit more. I know this is the case for me. There is a HUGE and noticeable difference in my attitude on nights where I have a plan versus those I don’t. Just ask my family. They’ll keep it real. You’ll be less likely to eat meals out, and eat more meals at home. Another reason to love the art of meal planning – you’ll get to eat more meals at home. This not only saves you money but allows you to eat better too. Meals out are often higher in sodium, sugar, and fat; ingredients that can slow you down versus fuel you up. You’ll actually make these recipes… wowing your friends and family. I’ve had the opportunity to review a few different meal planning sites and for the most part, they often have many of the same benefits in common. Why? Well, because they give you tools to plan out dinner and that’s pretty useful for the majority of us. But what really stands out for me when it comes to Gatheredtable is the simplicity of their recipes. I love the inspiration that more complicated recipes provide, but when I’m planning out real-life meals for everyday of my week, I just want simple, no-fuss ideas. I call these “real-life” ready recipes and Gatheredtable is my go-to source for those. Like me, I think you’ll actually make these recipes, not just pin them for later. 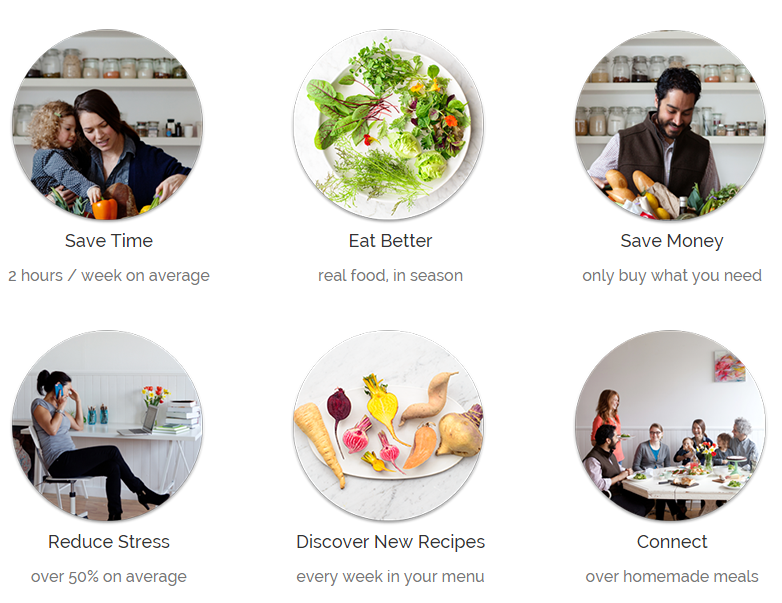 Gatheredtable’s meal planning services aren’t free (sadly) but they are affordable. 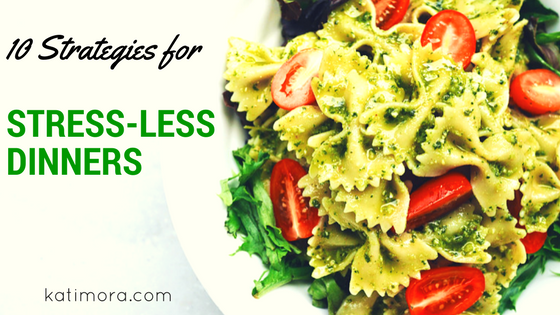 Plus, if you stick to it, odds are good you’ll end up saving money by eating out less and eating in more. Want to try Gatheredtable out? Try it free for seven days! And if possible, I’d love to hear all about your experience! Disclaimer/disclosure: Affiliate links to Gatheredtable’s website are included in this post. Photos were made available to me by the Gatheredteam; however, I was not financially compensated for this review or asked to share my opinions. These opinions are uniquely mine and based on my own user experience with Gatheredtable. Planning out meals at the beginning of the week not only helps my family eat more meals at home, but it also helps keep meals affordable and timely. 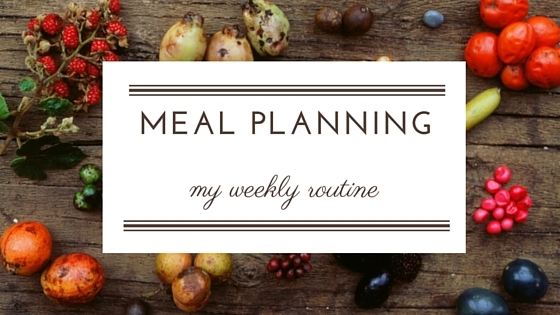 If you’ve been following along, you know I’m a big fan of meal planning. Not the kind of meal planning where you get stuck on the details, but the sort of planning where you get your basics covered, yet leave a little room for flexibility and fun. Taking the time to plan prevents some of those “oh shoot, we have to eat” moments – ensuring that your cupboards have some nourishing foods at the ready no matter what life throws your way. For me, having dinner ideas at the ready really does help reduce in-the-moment stress and never lets my family get overly hungry while I try to mull over what miscellaneous ingredients I could throw together for a meal. My meal planning routine is rather simple, but effective. Curious how I make it work? Here are a few of my favorite meal planning techniques to get you started. Start with one meal. I’ll let you in on a little secret… I never plan out an entire weeks worth of meals. Nope. Never. Instead, I focus my attention on the meal that needs the most work – dinner. By having a plan in place for this meal, our family doesn’t stress out about what to eat or waste time trying to figure out what ingredients might go together. Instead, we’ve already done the leg work – allowing us to get out the door quicker if we have to or spend more time around the table when our schedule allows. To start meal planning successfully, it’s helpful to identify which meal might benefit the most. Depending on your schedule, you may even have just one or two nightly meals that really need some work. Focus your attention there. The small amount of time you spend planning for those meals ahead of time will be worth the investment, trust me. This planning style ensures we have a strong meal structure in place, but still allows for flexibility. If we have extra ingredients on hand, flavorful herbs or spices, or need take the flavor profile up a notch by making a few tweaks, we can do that. But no matter what, we’ve got a pretty solid start. Check your phone. Over the past few months, Aaron and I have been taking our finances pretty seriously. God has blessed us both with jobs and opportunity, and we both felt pretty convicted a few months ago to stop wasting the financial resources we’ve been blessed with. That means I’m always on the hunt for a good deal. Thanks to apps like Ibotta and Checkout51, its easy to save a few extra dollars here and there. Of course, this means planning discounted items into your weekly meal rotation. And be careful – sometimes you’ll still save more money by buying the generic brand at the store or skipping the deal all together. Only use discounts on foods you’ll actually utilize. If you shop at Kroger, you’ll want to download their app for extra savings. I use it all the time to clip digital coupons. And if you shop at Walmart, try there Savings Catcher app. Keep your plan visible. After I’ve planned out my meals, bought the ingredients I need, and submitted my receipts for rebates, it’s time to put those meals into action! I find it helpful to keep the list on my fridge so that in case I forget what I planned (which I often do), I can quickly refer to the list. Meal planning can serve as a great tool to help you eat more nutritious, affordable meals at home. I hope you’ll enjoy the process. And of course, if you have any meal planning secrets, I’d love to know all about them! Disclaimer/Disclosure: A referral link to the rebate app, Ibotta, was utilized in this post. For more information on Ibotta’s referral program, visit the Ibotta website. 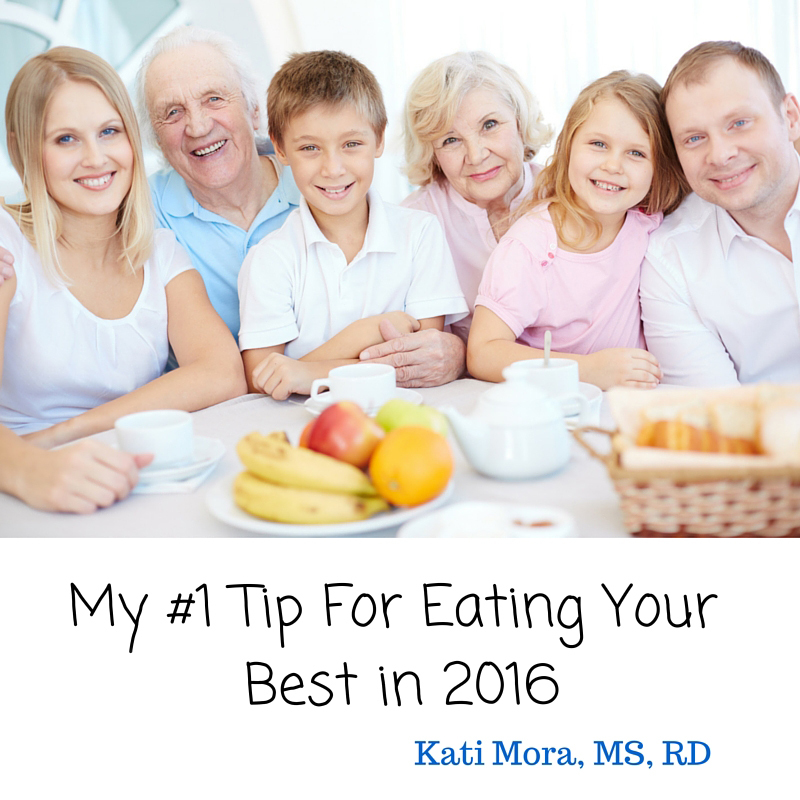 Want to Eat Your Best This Year? Start Doing this One Thing! What are you doing to eat your best? Are you tackling a new years resolution or possibly trying to make sense of the new dietary guidelines? I’ve been monitoring the chatter and it seems like many people, like each new year before this one, are putting their best foot forward in an attempt to change the way they eat. Unfortunately, a lot of what I’ve seen isn’t going to result in positive, long-lasting change. In fact, at this point, you may already be struggling with the goals you have set or may have given up entirely. So I’m going to keep things super simple and help guide you with one simple tip. Make meals at home and eat them together. Earth-shattering right!?! No, it doesn’t really get any more basic than that. But if you aren’t doing this one essential step, it’s probably going to be difficult to eat well for an extended period of time. You see, none of the other food rules matter if you aren’t actively living out wellness. To do this, you have to make time for those nourishing foods that will equip your body to do amazing things. You also have to get familiar with their flavors and their uses, and the only way to truly do that is to start figuring out how to utilize them in the kitchen. But I get it… this seems pretty vague. Not to mention, it’s hard to make the time or know where to start. Luckily, you have me here to help you. And guess what? This is a principle I live by. BUT please don’t read this as “Kati eats every meal at home. I do work full-time, commute an hour and 10 minutes one-way to my office, have two boys in school, a husband who is often off on trips for work, and we just recently became foster parents. I don’t want to give you a false representation of my life after all! Yet for us, we are able to get meals on the table most nights because it’s a priority for us. We’re also okay with the occasional failed meal and the exploratory nature learning to cook requires. So here are my real-life, practical tips for eating meals at home together. First, commit to it. Make the decision that this matters. By doing so, you will already be more intentional about making time for meals. Make a plan. Take an honest look at your week ahead. What days can you make a meal at home? Even if its just one day this week, that’s a step in the right direction. Kick those excuses to the curb. If you aren’t making meals at home, there are probably obstacles, both big and small, preventing you from doing so. Don’t let those obstacles make your decisions for you. Do what you can to make time for meals at home. For my family, we took ownership of our dinners and are intentional about keeping that space open. Between 6-7 pm we eat. We make this known to our friends and family so that no one is offended if we say no to something occurring during that time frame. Start with the basics. Once you’ve committed yourself and found the time for making a meal at home, you’ll probably want a few recipes to start out with. Although you can easily search online for a variety of recipes, another great way to get started is to identify a few of your families favorite meals. Can you recreate them at home if they are meals you typically order out? Or perhaps they are at-home family favorites that you can modify by adding in fresh ingredients. To truly discover how foods work together, simple is typically best. Whole fruits and vegetables, grains, dairy, beans, legumes, seafood, meat, herbs, spices, and oils – and if you ever thought eating “healthy” was limiting, well, you might just be surprised with just how many basic foods are out there. Have fun. Enjoy your time trying new food combinations and spending time together. Keep in mind that eating well isn’t just about eating the “right” foods. Its about what foods rich in nutrients equip you to do. Hopefully, its more than counting calories – hopefully its about living a very full and active life. Never stop learning. You’d think with as long as I’ve been a dietitian I would have learned all there is to learn about food and nutrition. Nope. Not. even. close. And that’s part of what I love about this field. It’s important to always be learning and to always have an open mind. It’s a journey and it’s definitely one worth having. As you begin enjoying more meals at home, I hope you’ll share your successes (and failures!) with me. I’ll be sure to do the same as I continue to learn and grow along with you.